Fresh baked cookies in an ice cream sandwich, all for $2. Can we wait in line, please? HOW MUCH: $2 per ice cream sandwich!!!!! If you see a line around the corner in Westwood, then you know it could be a couple things. Maybe it's a line of crazy fans waiting for the latest movie premiere event in Westwood--there's tons a year here. Maybe it's a line leading into the course reader store in Westwood. Sigh, there goes $80. Or maybe it's the most common one of them all: a line to Diddy Riese! 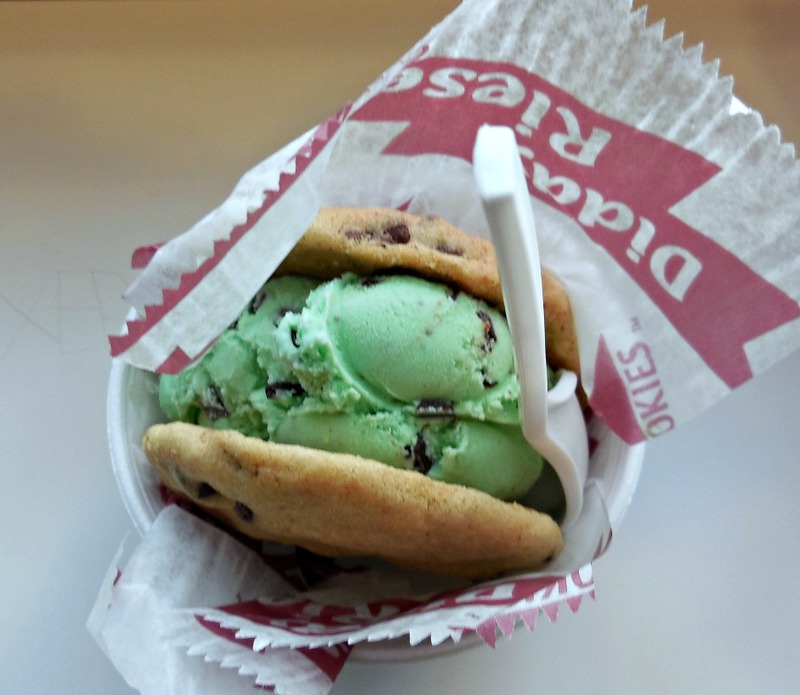 Diddy Riese is legendary for its ice cream sandwiches made of freshly-baked cookies and also for its very cheap price. Of course, the old-school folks will complain that it used to be even cheaper, but inflation yadda yadda higher minimum wage all that jazz. The fact is, in today's day and age where a cup of milk tea could go for $4.50 and no one even bats an eye, Diddy's $2 for what is essentially two cookies and a scoop of ice cream is still a steal. The funnest part of Diddy is waiting in line with your friends--maybe you go to UCLA, maybe you're just in Westwood for some fun--and then getting closer up and scheming which combination you'll go for. Do you do a chocolate chip cookie and oatmeal cookie combo with mint chocolate chip ice cream? Or is that too much chocolate? Maybe go for vanilla? The choices are endless (OK, math majors, I get it: the choices are not TECHNICALLY endless. There IS a large permutation of choices though, okay?). The cookie sandwiches are absolutely delicious and definitely are better eaten in a cup and with the help of a spoon. Amazingly, it takes a while for these bad boys to melt, and they're notoriously difficult to eat (they're just really large treats). Another thing that we've learned after being here so many times is that these things make you so incredibly thirsty! A swig of water or milk or something tastes like heaven. The cookies in themselves are amazing. They're soft and fluffy, and the chocolate chips (if you get 'em) melt in your mouth. In fact, a lot of people just order a couple cookies or maybe a dozen. Diddy is very popular for buying a bunch of cookies and then giving them out at events that you basically would never go to besides for having free cookies. And wanna be a true Rogue One? (Any Star Wars fans here? Any?) Then get the shaved ice here, which we heard is actually very good! So the next time you're in Westwood, stop by the biggest line in town--Diddy Riese!